I know you show up here mostly because you like food and because you expect that I’ll talk about food. You don’t come to hear my confessions. Yet several times in recent months I’ve subjected you to them. I sincerely apologize, I do, but I guess I’m not quite done, because here comes another: I have had a lifelong Fear of Pie. Well, it’s not the pie I fear, because that would be silly. Pie, especially fruit pie, is my favorite dessert. It’s the making of pie I’ve feared. You can trust me with the innards of any pie, I think, but the crust? I cringe. My hands go cold and clammy. My mouth goes dry. I’ve lived with this phobia my entire adult life. I’ve spoken of it here before, and eating a bit of humble pie, I offered a compromise, a more rustic version of pie, the galette. But I’d vowed this year to meet pie head on. For a very special girl’s 9th birthday, my gift was a series of baking dates together. Sici and I laid them all out, from most basic to — you guessed it — most feared. Kids, as you’ve no doubt experienced, are far more perceptive than we sometimes pretend, and they’re quite adept at picking up our true feelings no matter what words we speak. Point is, I think she knows. I swear, hand on heart, I’ve so not wanted to contaminate another generation with pie fear! But this girl wasn’t about to be contaminated or deterred. She’s a trooper, an adventurer, a girl with a can-do attitude, and I’m taking a lesson from her on this one! With our pie date looming, it was time I practiced. You’re right, of course. Why would you take a lesson from me on pie crust? Why read another word? You’ve got a point. But here’s my thinking: I’ve been doing quite a bit of research on the subject. A number of sources claim they hold the secret for the perfect pie dough, and I’m not saying they don’t, but I’ve remained unconvinced. If you’ve ever read Cook’s Illustrated, you know that they’re renowned for making hundreds of versions of a recipe in their test kitchens in order to arrive at “perfection.” They’ll lay out a case, sometimes quite scientific, and in this instance, I was looking for science — hard scientific evidence, something to bring me back to the Age of Reason. I won’t lay it all out here, because I actually do have a life apart from this and you do too – but if you’re interested, you may be able to locate a copy of the article Foolproof Pie Dough, published September, 2010. I’ll give you the recipe here, but the case they made is brilliant and the article very interesting if you’re so inclined. I summoned my inner-Sici and made the pie dough yesterday. It wasn’t picture-perfect, but everything else about it was. It was flaky, tender, flavorful. I did it! I’m still basking in euphoria. 1. Process 1½ cups of flour (7½ ounces), the salt and sugar in food processor until combined, two one-second pulses. Add butter and shortening all at once and process until homogenous dough just starts to collect in uneven clumps, about 15 seconds. (All the flour will be coated and the texture will resemble cottage cheese. Some very small pieces of butter will remain.) Scrape the bowl with a plastic scraper, evenly distributing the mixture around the blade. Add the remaining cup (5 ounces) of flour and pulse until the mixture is evenly distributed around the blade and the mass of dough is broken up, 4 to 6 quick pulses. Empty the mixture into an empty bowl. 3. Adjust the oven rack to the lowest position and place a rimmed baking sheet on the rack. Preheat the oven to 400°F. 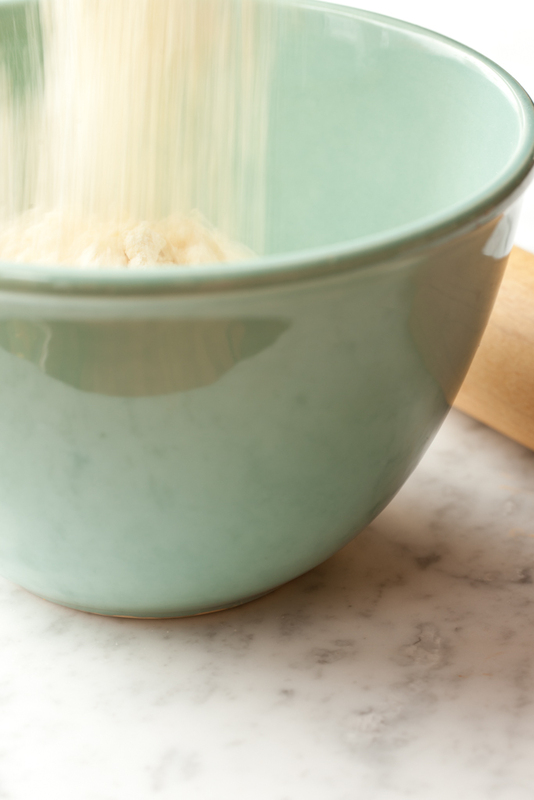 Remove the dough from the refrigerator and roll out on a generously floured board (using up to ¼ cup of flour as needed) into a 12-inch circle about one-eighth of an inch thick. Roll the dough loosely around the rolling pin and unroll into the 9-inch pie plate, leaving at least 1-inch overhang all around. Working around the circumference, ease the dough into the pie plate by gently lifting the edge of the dough with one hand while pressing into plate bottom with the other hand. Refrigerate for 15 minutes. 4. 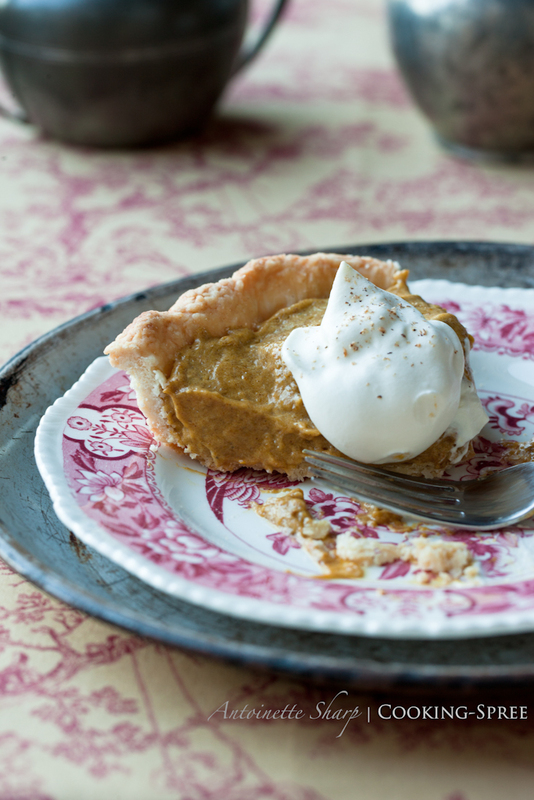 Trim the overhang to ½ inch beyond the lip of the pie plate. Fold the overhang over on itself, with the folded edge even with the edge of the pie plate. Using thumb and forefinger, flute the edge of the dough. Refrigerate dough-lined plate until firm, about another 15 minutes. We’ve enjoyed this pie every Thanksgiving for years. 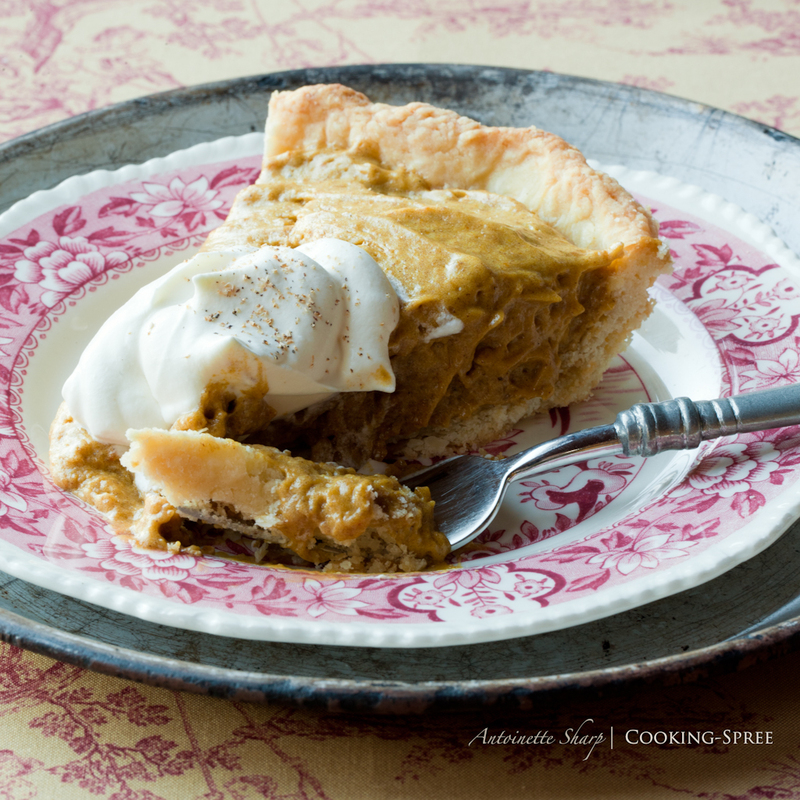 Mom would often bring the pumpkin custard pie, and I’d make the chiffon. But (as I’ve already made quite clear) I didn’t do pastry crusts. So this pie always ended up in an alspice-laced graham cracker crust, which though still quite tasty, always left me feeling like I was cheating. Soften the gelatin in water. 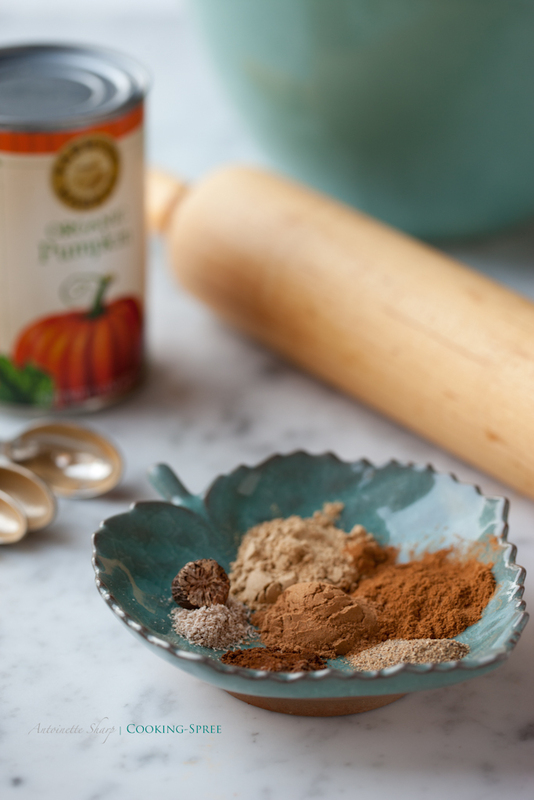 In a sauce pan, whisk the egg yolks; add brown sugar, pumpkin, pumpkin pie spice and salt. Mix well, then stir in the milk. Cook over medium heat, stirring continually until it begins to boil. Reduce heat to maintain a gentle boil, continue stirring and cook for 2 minutes more. Remove from the heat, add the softened gelatin and stir until melted. Transfer to a bowl and cool completely. 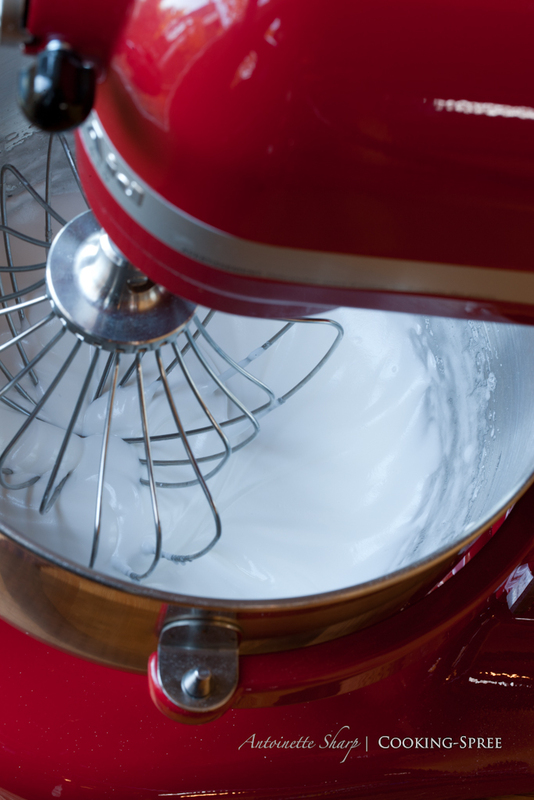 In a mixer bowl add cream of tartar to the egg whites and beat until soft peaks form. Gradually add the 6 tablespoons of sugar, 1 at a time, beating until stiff but not dry. 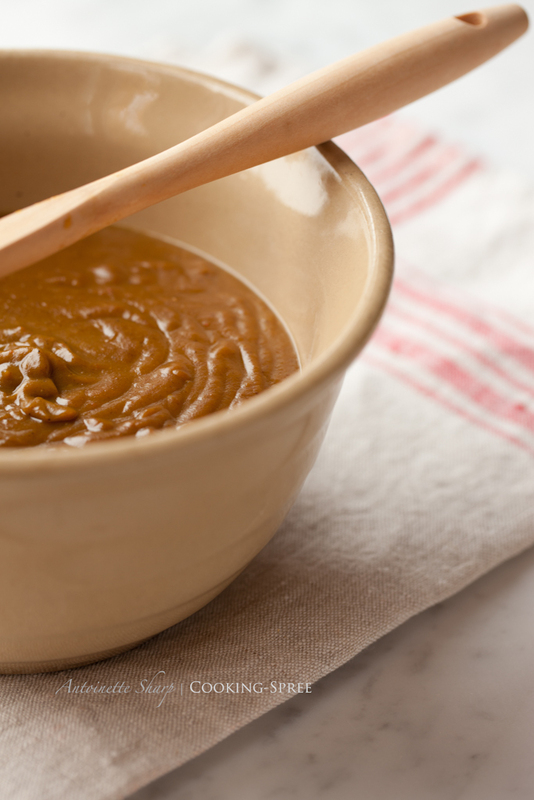 Using a wire whisk, beat the pumpkin mixture until completely smooth and no lumps remain. Gently fold in the beaten egg whites. Spoon into a cooled crust. Chill. Top each slice with whipped cream and a dash of nutmeg. 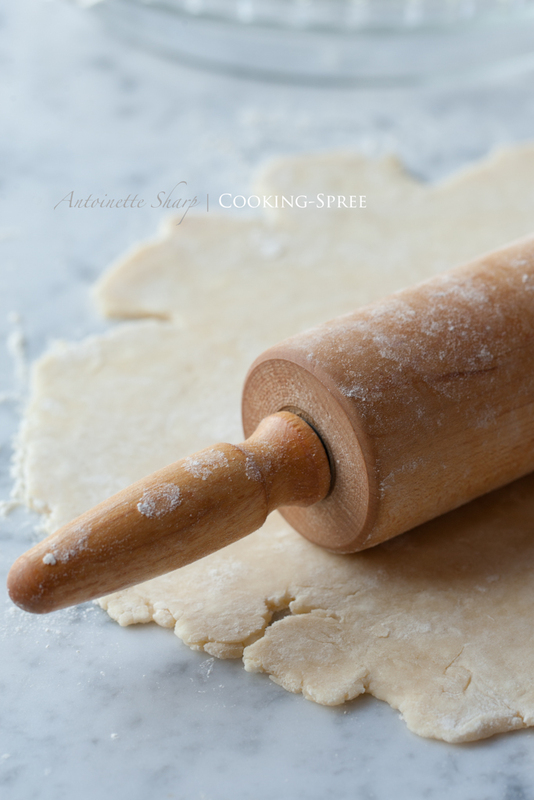 Annie, the rolling of this pie crust was a breeze – absolutely no sticking to the rolling pin. It does need to be chilled properly, flour laid down on the board (I used marble because it stays cold) and enough flour sprinkled on during the process. I used a bench scraper to loosen it from around the edges to turn it over to roll from the other side, again dusting with a bit of flour, under and on top. And flour your hands when you handle the dough. To make sure I didn’t add too much flour, I took the advice of Cook’s Illustrated who said up to 1/4 cup was fine and I measured that out ahead of time so I’d not err on the side of adding too much. I ended up not using any more than 1/8th of a cup I suppose. I guess you can tell, I’ve kind of got a thing for dishes. I don’t have a huge assortment or anything, but I do keep my eyes peeled for little serving pieces or small dishes I like. The plate I served the pumpkin pie on is not of the same Strawberry Fair set as the Pom & Pear salad. My thinking is, mix it up. For big gatherings, I’ll frequently set tables with mix-matched china. But if you love red, why not just start snooping around second hand or antique stores and collecting red and white or red and cream dishes in patterns that you like and put them together. Personally, I love that. I understand, I had a fear of making pie for a long time! Once you master the dough, you can master anything. I just love these photos, especially the action shot. Now THERE’s an encouraging word! Thank you J! Your recipes are mouthwatering and your joy in bringing them to us is evidenced by your engaging and inviting prose. I always enjoy reading them and look forward to the next one. Hooray for overcoming your fears and doing all that research and for having a brave daughter. I can’t believe you use the good stuff, but maybe you got it using the pie as an excuse, which is a good strategy. I know people say use quality ingredients, but we tend to cook with cheaper booze than what we use for drinking. But back to the recipe, it looks fantastic! Since it only required 1/4 cup, and the “good stuff” is all we had, I went for it. Not the most frugal move, but I was in a devil-may-care mood by this point! : ) Thanks for comments! Mama, your joy and delight here is so positively delicious. I want to climb into this post and live in it! These might be my favorite photos ever here, and that is no easy task. I am with Annie — this set of color combos is to die for. You even managed to inspire and convince me to the point where I may take this pie making thing on for myself. (Truth be told, probably next year.) But I’m gonna love eating yours this year! Since I only make pie at Thanksgiving, I have had spotty success over the years. Sometimes the crust has been the flakiest ever, and other times it is unremarkable. I remember using a recipe which called for vinegar with the ice water. Perhaps vinegar had the same gluten inhibiting action as vodka? I sure want to try this pie dough. I wonder what it would be like with only butter and no shortening? I may experiment in that direction…Those pictures get me salivating! Ok, not wanting to go all chemist on you but here’s why COOKs says not all butter – butter is 20% water, so when it melts, the water in it mixes with the flour creating additional gluten, toughening the crust. The addition of just a small amount of shortening maintains the proper balance of chewy and tender/flakiness. That’s what COOKs says. You’re absolutely right about the vinegar. The addition of vinegar or lemon reduces the pH, and an acidic environment inhibits gluten formation. 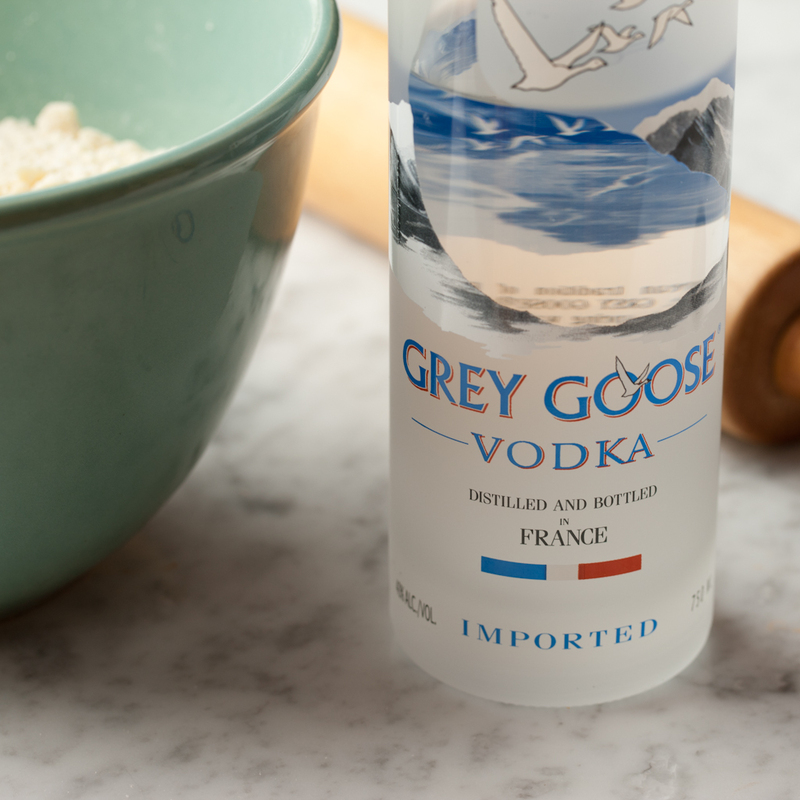 BUT, the vodka does it one better because you can only add about a tablespoon of vinegar before you throw the taste completely off – whereas you can add a quarter cup of the vodka, the alcohol all burning off in the baking, and not affect the taste at ALL. Pretty cool, huh? People always leave a celebration where this is served, saying, “I’ve got to get the recipe for that!” Now we all have it! Thank you! So proud of you for overcoming your fear! This is the first time I’ve seen a crust recipe that uses alcohol. I’m fascinated by it. And will definitely try this on my next pie!